This item is expected to ship 4-6 weeks after the event on July 12, 2019. Your guard is up, but you quickly move along when their problems don’t take the form of a full-blown eating disorder like anorexia or bulimia. Disordered eating behaviors are frequently hiding something deeper – serving as a coping mechanism for the unresolved trauma that lies beneath. Without addressing the trauma behind the disordered eating your client will fail to find the relief they seek. 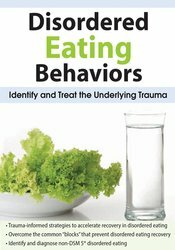 In this recording, you'll learn how to assess and treat disordered eating from a trauma-informed, body positive lens, for improved outcomes! Experience the satisfaction of helping your clients to resolve their traumas and release the unhealthy disordered eating behaviors with this powerful non-diet paradigm! Express a thorough understanding of childhood trauma, attachment, dissociation, and the researched, causal link to disordered eating. Utilize evidence-based, assessment tools and interventions for disordered eating, trauma, and dissociation, as well as spouses/partners and families/caregivers. Examine the history of eating disorder treatment, disordered eating in the United States, and the socio-political/cultural factors involved in disordered eating. Identify how to diagnose and treat non-DSM-5® disordered eating. Evaluate personal behaviors or counter-transference that could be impeding treatment efficacy. Apply case studies and conceptualization for incorporating body-positive terminology, awareness and intervention. Digging for the roots: is the disordered behavior a result of previous trauma? Lori Kucharski, MA, LMFT, LPC, CEDS, has practiced therapy since 2004 in a variety of settings: private clinical practice, supervision, training/consultation, and teaching graduate courses. She is currently completing her Ph.D. dissertation on trauma-informed education. She is a clinical member and Approved Supervisor for the AAMFT and a Certified Therapist, Approved Consultant, and Training Provider through EMDRIA. As the regional coordinator for the regional EMDRIA and Trauma Recovery Networks, she specializes in complex trauma, disordered eating, and attachment. She has presented and trained on disordered eating and trauma since 2011 and advocates for body positivity, holistic wellness in trauma recovery, and disordered eating awareness.